BELOX | BELINKA PERKEMIJA d.o.o. Belinka Perkemija successfully follows market requirements in the area of disinfection, especially in the food industry. 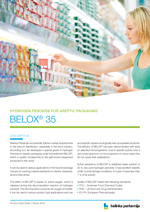 According to it we developed a special grade of Hydrogen Peroxide for aseptic packaging under the trademark BELOX®, which in quality corresponds to the well-known equipment producers in the world. It can be used in various applications in the food & beverage industry for packing material disinfection in diaries, breweries, alcohol free drinks.